Pacific Wrecks - Jeff Johnson - Researcher 13th Air Force, 5th Bombardment Group "Bomber Barrons"
Researcher 13th Air Force, 5th Bombardment Group "Bomber Barrons"
World traveler and 13th Air Force researcher and historian, Jeff has visited the battlefields of Guadalcanal to dive and walk several exciting wreck sites. From home, he maintains several websites: 5th Bomber Barons and Out of Bounds. 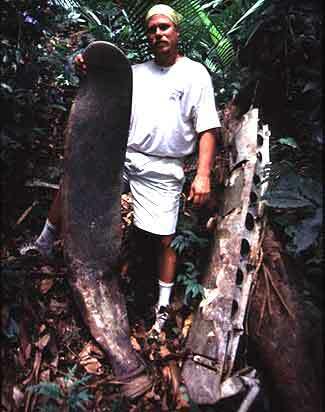 Discovered in 1997, this plane crashed into a ridge 1,500 feet up on the tip of the island. Jeff was the first to bring back photos that lead to its successful identification! This wreck has an incredible story, and despise 60 years underwater is still easily identifiable as a B-17. D. H. Shelton was assigned to a different plane than usual. When his friend Stuart heard that his usual plane was lost for over 55 years thought his friend was KIA.